Her CIA bosses think she’s the bomb. Kitalia Ore is positive of that fact. Okay, fine. Kitten MacLean. And they’re her parents, but it’s so much more fun to imagine them the other way around. And J.J., her MI6 contact? He’s in love with her. Doesn’t matter that her closest confidant, Jimmy Jones, hasn’t spoken a word to her since first grade. Everyone at school adores her, too. Sure, they might not know it yet, but every single student at Rimtree High is her best friend. Naturally. When a new girl—Kit’s choice for sidekick in her daily adventures—is being bullied, however, it’s time for Kit to take charge and leave her fantasy world of fearless bravado and easy victories behind. Can the “real” Kit use her make-believe practice to her advantage? The world outside her CIA missions is far different than she’s used to, and her usual happy-go lucky heart is about to take the beating of a lifetime. But Kit has never backed down from anything in her life and she’s not about to start now. Time to find out what she’s really made of. Before the bad guys ruin everything. Did you know it’s possible for a book to be heartbreaking and uplifting at the same time? Well, it is. 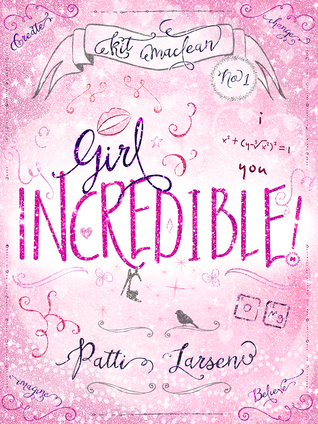 And I think that’s the best way I can describe Girl Incredible. I loved this book. I loved Kit and I could so identify with the issues she was having. I think a lot of people will be able to. Kit is possibly the happiest, most positive character I’ve encountered. She thinks everyone is her best friend. She’s sees everything as a way to spread her happy. And I think that’s what makes the book so heartbreaking at times. The fact that her vision of her life doesn’t always match the reality of what’s going on. I loved reading about her alter ego, Kitalia Ore, and I loved how this imaginary world mimicked what was going on in her real life. But for me the meat of the story was what was going on in her real life and how she was dealing (or not dealing) with the challenges that she was faced with. I was riveted and pretty much read the book in one sitting. I had to know what was going to happen. And I was rooting for everything to go alright. It’s almost as if I became super protective of Kit. This was such a neat read. It just made me feel really really good. And who doesn’t like that? Kelly has a great life. The kind of life people wish for, in fact. She has an upwardly-mobile career, and a stable, loving relationship with her college boyfriend, Rob. At this very moment, anyone looking in from the outside would see her life moving in exactly the right direction. Except, the path in front of her might not be the way for Kelly at all, and the only person who gets this is her “work boyfriend” Garrett. He’s the one who really gets how trapped she feels. And then everything spirals out of control during the holidays, and when Kelly should be celebrating the future, she finds herself questioning what she really wants from her life . . . and who she wants in it. I can be very picky about my chick-lit. I’m okay with romance but it can’t be the main purpose of the book. The female lead has to be relatable. And the plot has to be engaging, not cliche. Thankfully The Work Boyfriend has all these things and then some. What a smart, smart read! Just awesome. The writing is snappy and the dialogue just flows. None of the characters are stereotypical and I found Kelly very relatable, even though I am nowhere near where she is in life. I think the reason for this is because her insecurities about life, and whether she should do what she’s supposed to do or what will make her happy, is something that a lot of us struggle with. OMG the ending. I don’t want to give anything away, but the ending made me want to give the author a hug. It’s unexpected but so real and made perfect sense for the story and Kelly. It was perfect. 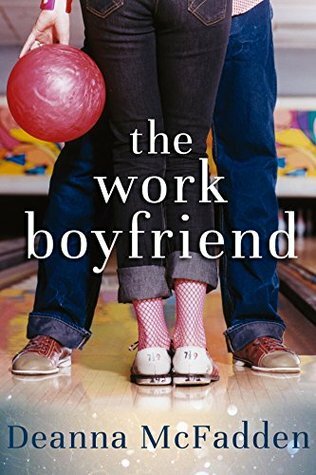 If you enjoy a smart story with relatable characters, then The Work Boyfriend is right up your alley. I look forward to reading more from McFadden.